As part of a wellness initiative, UC Davis rolled out a pilot training program to help physicians streamline and make better use of time spent on electronic health records (EHR). Physicians who completed training are spending on average 25 fewer “after hours” per month working in the EHR system. Satisfaction and efficiency scores for participating physicians' increased by 12 percent and 24 percent, respectively. Frustration with electronic health record (EHR) technology is often cited as a top contributor to America's physician burnout epidemic. Melissa Jost, a manager of the clinical informatics team at UC Davis Health in Sacramento, thought using the technology did not have to be so hard, and she was right. After a pilot program in four ambulatory clinics in 2017, UC Davis Health rolled out an unusual training program that is improving physicians' satisfaction with the technology while increasing their efficiency. Each physician's EHR use is analyzed to identify tasks that can be performed more easily. Then one-on-one training, customized for the physician's preferences, is conducted to optimize his or her use of the system. The result: Physicians who have completed training are spending on average 25 fewer “after hours” per month working in the EHR system. Those physicians' satisfaction scores have increased by 12 percent, and efficiency scores by 24 percent. Scott T. MacDonald, MD, an internist who serves as UC Davis' EHR medical director, said the program's early success highlights the lack of support physicians have had since EHR technology arrived on the scene. “As a society we have shortchanged our physicians by rolling out these [EHR] systems and not providing adequate initial and ongoing training on how to use the tools,” he said. Like most health systems, UC Davis had mandatory training when its EHR system launched in 2005 but no routine or standard training since then. As new functionality was added to the EHR system, physicians were instructed about new things they needed to document, and training was offered on a voluntary basis, but documenting efficiently was never a focus. Peter Yellowlees, MD, MBBS, has chaired the UC Davis medical staff well-being committee for nine years, and he sees the long-term stress associated with EHR use taking its toll. The document established three goals: Reduce the effort and time required to record information in EHRs for health care providers during care delivery; reduce the effort and time required to meet regulatory reporting requirements for clinicians, hospitals, and health care organizations; and improve the functionality and intuitiveness (ease of use) of EHRs. The document identifies a dozen strategies in four areas designed to meet those goals: clinical documentation, health IT usability, and the user experience; EHR reporting; and public health reporting. While the government figures out how to actually deliver on those goals, Jost and a small team of analysts at UC Davis are trying to make life better for the physicians working in today's reality. Since November 2017 the health system's Physician Efficiency Program (PEP) has trained 362 physicians in 17 specialties in ambulatory clinics all over northern California. The PEP Squad, as it is called, will roll into the UC Davis neurology department this spring. It is scheduled to move through all the health system's clinics by 2020. Each clinic engagement typically lasts three weeks. During the first week a team of three analysts shadows clinicians to learn how the EHR system does, and does not, support their work efficiently. Beginning in the second week, each physician receives four hours of one-on-one training, in which a PEP Squad analyst watches the physician use the EHR, then coaches on how to work more efficiently. UC Davis Medical Group's Rancho Cordova said in a video explaining the PEP initiative. In addition to the individual sessions, trainers provide two “PEP talks” each week to address problems common to many of the clinic's EHR users, such as ordering labs. Meanwhile, PEP Squad “builders” work with a designated clinician to identify how the software could be modified for the particular needs of that clinic: for example, updating preference lists or creating speed buttons. Because the software developer is dedicated to that clinic during the engagement and working with a subject matter expert, changes can be made more rapidly than going through the standard IT support process, Dr. MacDonald said. And the modifications are made while the trainers are on hand to demonstrate them, making it more likely that physicians will benefit from them. “There are templates that I'm using now that are much faster and more thorough,” Dr. Luke said. In addition to shadowing clinicians during the first week of a clinic engagement, Jost and her team use three other sources of data to understand a physician's EHR use. Each physician's responses allow Jost and her colleagues to understand his or her specific frustrations with the technology, the level of satisfaction with the current EHR configuration, and the physician's perceptions of the amount of after-hours time spent working with the technology. To support the PEP initiative, UC Davis custom-developed a report that identifies the number of minutes a physician uses the EHR outside of scheduled clinic hours. This allows analysis of whether the training does in fact reduce the amount of “pajama time” physicians are spending with the system. Jost's team worked with EPIC, the EHR vendor UC Davis uses, to create a report that shows how each physician uses specific EHR functions and the amount of time a physician spends on specific EHR tasks. This allows PEP Squad trainers to home in on opportunities for improvement and develop a custom training plan that will offer the most benefit to that specific physician. Physician dissatisfaction with EHR technology will not be solved by training alone, Dr. MacDonald said. “I think we can make a big dent in the problem through training, but it's not the whole answer,” he said. Among other things, the ONC report said physicians write notes that are longer than necessary as they try to comply with payers' coding and documentation rules. He and Dr. Yellowlees believe that by working with UC Davis' coding specialists they can identify the minimum amount of information that needs to be in a note. “We're going to try to change culture to get people to start writing less, which will save them time,” Dr. MacDonald said. Beyond that, he believes that the PEP initiative is an early step toward proving that reducing technology hassles is a burnout deterrent that deserves strong institutional support. “My vision is for a larger PEP team, as well as a better-trained core of physicians who have expertise and time and responsibility to help be a resource for their colleagues in their department,” Dr. MacDonald said. When relevant information is already contained in the medical record, clinicians can focus their documentation on what has changed since the last visit rather than having to re-document information. Both new and established E/M office visits, a Chief Complaint, or other historical information already entered into the record by ancillary staff or by patients themselves may simply be reviewed and verified rather than re-entered. The requirement for documenting the medical necessity of furnishing visits in the patient's home versus in an office has been eliminated. Potentially duplicative requirements for certain notations in medical records that may have previously been documented by residents or other members of the medical team have been removed. •. Busis NA, Shanafelt TD, Keran CM, et al Burnout, career satisfaction, and well-being among US neurologists in 2016 http://n.neurology.org/content/88/8/797.long. Neurology 2017;88(8):797–808. •. Office of the National Coordinator for Health Information Technology, “Strategy on reducing regulatory and administrative burden related to the use of health IT and EHRs: Draft for public comment,” https://www.healthit.gov/topic/usability-and-provider-burden/strategy-reducing-burden-relating-use-health-it-and-ehrs November 2018. •. Landi H. Survey: Physicians cite EHRs as biggest contributor to burnout. Healthcare Informatics, July 31, 2018. https://www.healthcareinformatics.com/news-item/ehr/survey-physicians-cite-ehrs-biggest-contributor-burnout. 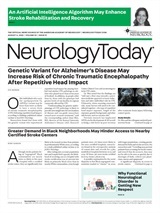 Neurology Today19(3):41-44, February 7, 2019.